Tales Of A Nomad: Swaying Palms and Floating Boats...!! On being transported from the world of traffic snarls, chaos, hectic work and continuous meetings to the world of lagoons and greenery, all of us stood awestruck when we entered one of the numerous houseboats parked on the very famous Vembanad Lake in Alappuzha. There are various types of boats like the 2 bedroom boats, 3 bedroom boats, boats with an upper deck, boats with A/C rooms etc. Everyday large number of such boats go on a lovely backwater ride with tourists gaping blissfully at the mesmerising scenery. Vembanad lake, the largest wetland ecosystem in Kerala has been the tourist hub of the state for past many years. Travellers from all over the world have a fascination for the renowned houseboat ride on this lake. As we embarked on this quaint form of transportation, all that appeared in the vicinity were the numerous floating rice boats a.k.a kettuvelloms, the swaying palms on the banks, different varieties of birds and the placid lake. The boat propelled forward with no specific route (not for the driver though) over the massive water body which lay spread in all directions. Photo clicks, video shoots, blowing kisses at the gorgeous firangi women on other boats, trying a hand at driving the boat were some of the activities that we enjoyed during the initial 2 hours of our sojourn. 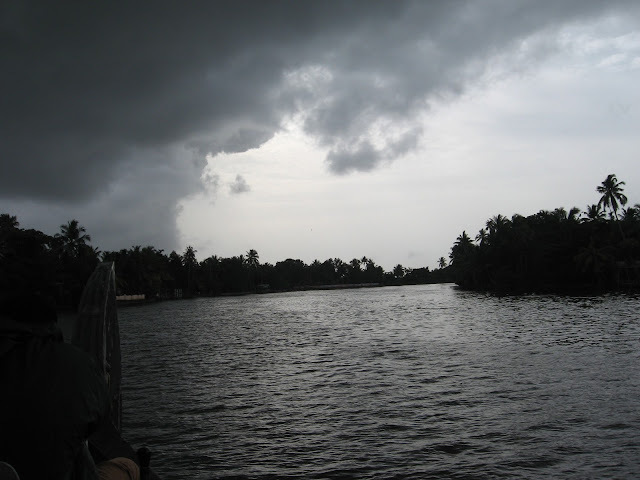 The well crafted boat sailed beautifully on the gleaming lake and went past the little villages, the tiny canals, the luring toddy shops and the green paddy fields. Due to the openness of the landscape, we were treated to some wonderful breeze under the hot sun which made us sway like the coconut trees on the banks. After a round of games that included cards and dumb charades it was time for some bacardi blasts and a sumptuous lunch. The lunch was prepared by the in-house cooks and the whiff in the air said it all. The mouth watering seafood delicacies were spread out and within a flash it was time to lick the fingers. As the blazing sun set, the gorgeous Kettuvellom was anchored to the shore. In fact many other boats were also anchored at this place and it seemed the right spot for some village walks. We trod through narrow passages and went past the small houses besides the lake to go down into the paddy fields. The green blades of the paddy turned yellow with the sun setting beautifully in the background. A lovely walk on the narrow paths of the paddy field reminded me that the last time I did this was ages ago. All that I could see was the orange sun spreading its rays over the spread-out field. The rustic charm of the country side was clearly evident. A visual treat indeed!! A visit to the villages of Kerala must include a visit to the toddy shops ( A big NO for the eves though). We however didn't venture into the shops but managed to get a few bottles of toddy. Toddy tastes best and fresh when it is had in the mornings. It turns sour as the day progresses. Nevertheless toddy is toddy and we happily gulped it down. Nestled nicely inside the comforts of the Kettuvellom, we stared at a few diminishing lanterns in the distance. These were either of the many anchored boats or of the houses besides the lake. That was in fact a very romantic sight. The place also had a small jetty and we had an extended photo session there. A maverick dance (toddy does keep your spirits high) and a tasty dinner ended the day's itinerary. The anchored boat floated happily through out the night and we slept not so peacefully with horror stories and mosquitoes for companionship. 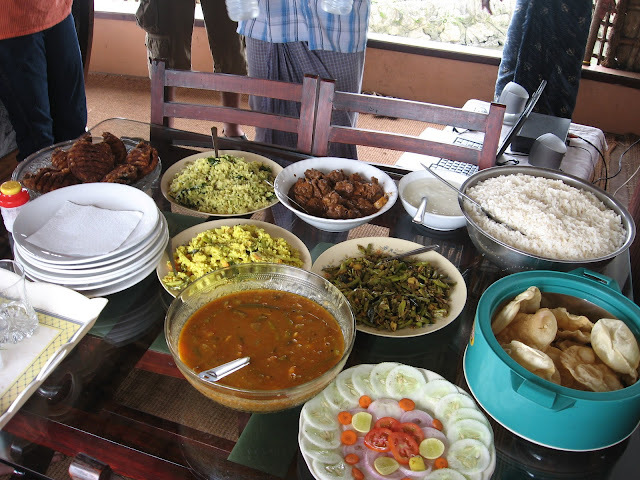 The next day began with a typical Kerala cuisine for breakfast after which we were on our way back to the shores. It was one of the most laid back holidays with absolutely nothing to do other than staring at the floating waters,the swaying palms and taking in the fresh air amidst the green surroundings. 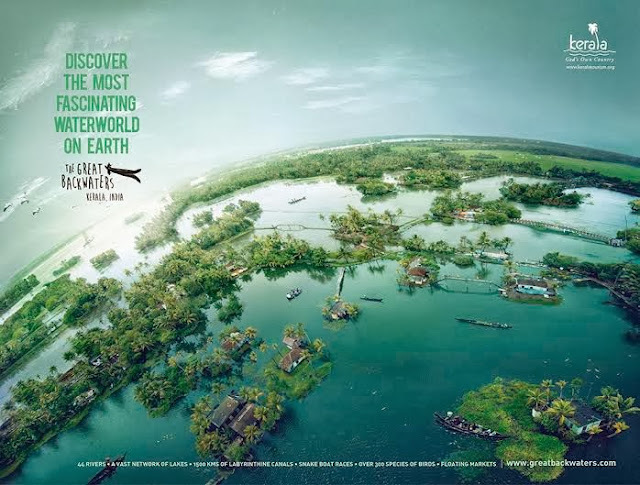 If you feel holidaying is all about just soaking yourself in natural surroundings while being floated around on a rice boat and eating some delicious sea food in Kerala style, I feel Vembanad Lake is the apt destination. Signing Note: Life can't get lazier than this...!! Yup, its a beautiful experience. Lovely description...! 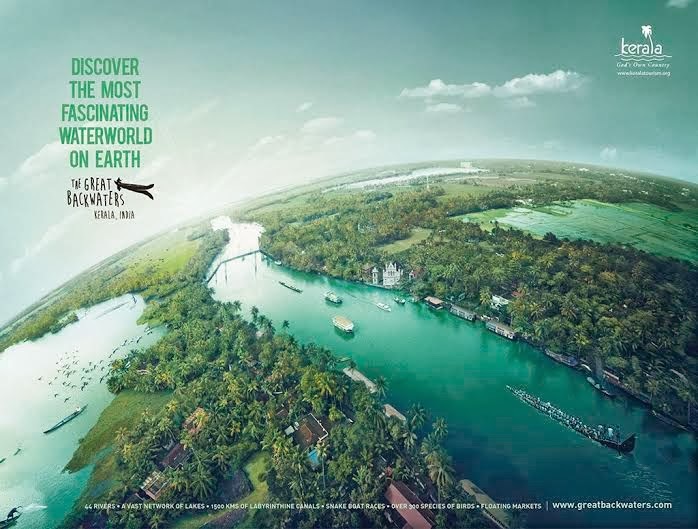 Rich with scenic imagery.. We should all go there as well with all the new additions..
@ Sneo... :). Let me know the next time you plan it. Could help you out. @ Pengz... Thanks a lot... Am game. Will plan it out when you are in India the next time. @ Sree... :):) You should definitely experience it. Thank you. Keep dropping in. :):):) Thanks a lot shylaja.. You should definitely plan this wonderful experience. nice blog.plz follow my blog too. Thanks you...shall definitely go through your blog.